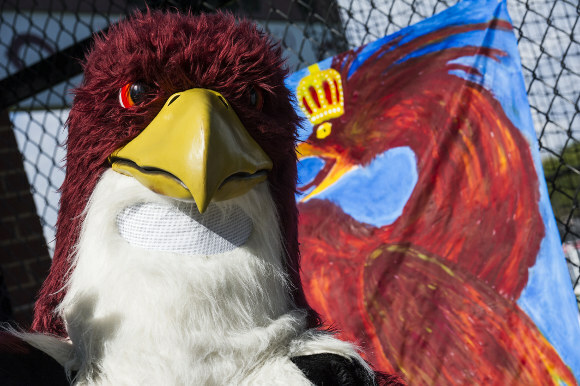 Much like an actual phoenix, the origins of Phil the Phoenix, the University’s mascot, are shrouded in legend. What we do know is this past academic year, five people have portrayed Phil—three men students, one woman student, and Bock himself. The Core caught up with two third-year Phils, who admitted little actual knowledge of mascot requirements beyond what one termed “school tolerance.” Both requested semianonymity (hence using their first-name initials), just to keep the mystery going. How long have you been Phil? Why did you apply? Phil J: I have only been Phil a couple times. There was no audition or application. [Brian] Bock just reached out to me and put me into contact with Admissions, who needed the appearance. Phil B: I’ve been Phil for a year and bit now. I was asked by a friend whose coach said they needed someone to Phil in for a game. How are your mascotting styles different? Phil B: My style is a bit of a friendly wanderer. I like to stroll about and surprise people with my joyful presence. Phil J: The other Phil’s probably a little more enthusiastic than me, but I pull more pranks on people. Little things like pretending to take someone’s phone really get the crowd laughing. What do you consider your “signature move”? Phil B: It’s really more of a stare. I’ll just walk up to someone and do the smolder. How secretive do you have to be about your identity? Phil J: You aren’t supposed to reveal your identity when you are in the suit. I don’t think there are any rules when you aren’t in the suit. Phil B: I have to be pretty careful. I don’t want to endanger my loved ones. According to Brian Bock the current suit was purchased in 2010. What’s it like inside? Phil J: It is very, very hot. Literally equivalent to sitting in the sauna. I try to wear as little clothing as possible [underneath the costume]. Usually basketball shorts, T-shirt, and thin socks. Phil B: It smells like a stuffed animal. They work pretty hard over at Phil HQ to maintain cleanliness. What other events do you appear at besides football and basketball games? Phil J: A lot of admitted student events. Phil B: University photo shoots, prospective student events, grad school events, and some alumni functions. What are some of the weirdest things people have said or done to Phil? Phil B: Someone said they’d only take a picture with me if they could ride on me. People are also always very interested in whether I’m a boy or a girl. I usually pantomime to say both. Phil J: A mom and dad of an admitted student yelled at their son when he didn’t take a picture with me. What do you hope to do after you graduate? Is there any way your experience as Phil will help you? Phil B: I hope to work with people or children in some capacity. Maybe for a nonprofit. Being Phil has made me a more confident and compassionate worker. He’s also shown me a lot of the different sides to people, which is a cool perspective to have. Phil J: I am going into investment banking, so probably not.